Calrec is showing its Type R modular, expandable, IP-based radio system for the first time at the Broadcast Video Expo, 26-28 February, at ExCeL, London. Type R makes use of standard networking technology and combines it with configurable soft panels that can be tailored to operator needs. Type R’s physical control system consists of three slimline panels: a fader panel, a large soft panel and a small soft panel. Each is compatible with COTS hardware and powered over Ethernet to keep cabling to a minimum. Also making its BVE debut is ImPulse core, the next generation audio processing platform. 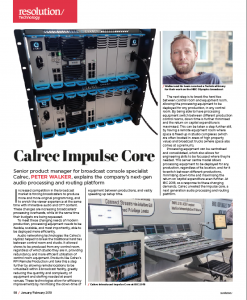 The ImPulse core is a powerful audio processing and routing engine with AES67 and SMPTE 2110 connectivity. Read our 3-page description of the new platform here. It is compatible with existing Apollo and Artemis control surfaces, providing a simple upgrade path for existing Calrec customers. Calrec’s compact Brio consoles will also be on show. The Brio36 includes an impressive range of on board I/O so it’s operational straight out of the box. It also has full Hydra2 network compatibility and a sensitive price point that doesn’t reflect the full and rich broadcast feature set. 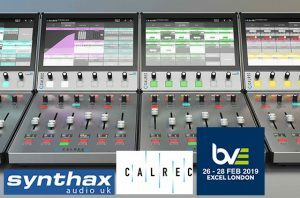 Calrec is supported at BVE 2019 by UK Brio partner Synthax Audio.